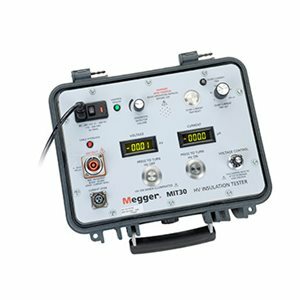 The MIT30 is a 30 kV Insulation tester that has been developed to satisfy the demand for a variety of high voltage, high accuracy, low current applications in electrical distribution industries, aerospace and defense applications. The MIT30 cannot be used on grounded/earthed test samples. Otherwise, the unit will be damaged. The unit offers unparallel accuracy and resolution, with a high voltage output from 0 to 30 kV dc., trip levels from 0 - 360 µA and a resolution of 1 nA (±1.5%). The MIT30 represents excellent precision in a field instrument, and gives the operator confidence in the meaningful results.